A sausage hotpot makes a great autumn supper and this tastes even better when made the day before - just reheat it ready to serve when everyone comes in from the cold. Preheat the oven to 200°C, gas mark 6 and also the grill to its highest setting. Brown the sausages under the grill for 8-10 minutes, turning occasionally. Heat the oil in a very large flameproof casserole dish dish and fry the onions for about 10 minutes, or until soft and golden brown. At this stage it will look as though you have too many onions, but they do reduce down with cooking. Pour in the stock, arrabbiata sauce, Guinness and brown sugar. Bring to the boil. 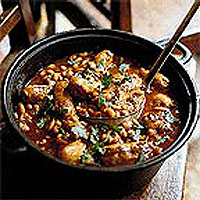 Let the mixture bubble for 2 minutes, then stir the beans and the sausages into the casserole and bake in the oven for 35-40 minutes until everything is bubbling and lightly browned on top. The sausages should be thoroughly cooked - prick them to make sure the juices run clear and that there is no pink meat. The liquid should have reduced to barely cover the beans, but the exact cooking time depends on the size of dish. If the liquid has not reduced enough, then pop the casserole onto the hob and allow to bubble for 2-3 minutes to evaporate a little more of the liquid. Stir the casserole, taste and season if necessary, then scatter with parsley and serve. If you prefer, try Waitrose Free Range Pork Chipolatas in place of the Pork, Herb and Garlic Sausages. Boned chicken thighs are also delicious cooked this way.